It was a beautiful Friday morning in September, and I found myself sitting opposite Francis Grogan in his office on Huntley Farm, about a 45 minute drive north of Zambia’s capital Lusaka. The farm is the heart of Zambeef Products, a US$300m-plus business. With my dictaphone on and pen poised over notepad, I was there to speak to the man behind the company and find out how it got to its where it is today. 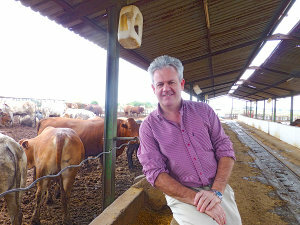 Grogan is the co-founder and CEO of Zambeef, a market leader in the production, processing, distribution and retailing of a range of food products, including beef, chicken, pork, dairy, eggs, edible oils and flour. Zambeef prides itself in that it adds value to almost all its produce and that nothing goes to waste. For example, once an animal is slaughtered, the head, hooves and organs are sold, and the company even manufactures shoes from the hides under its Zamleather subsidiary. In addition to over 110 retail outlets throughout Zambia and three wholesale depots, the group also runs the fast-food brand, Zamchick Inn. Grogan was born and raised in Ireland and after finishing a degree in agricultural and meat production science he started working for a large meat firm in the late 80s. So how did he end up running one of Zambia’s largest companies? It all started with an “out of character” decision to apply for a position he saw advertised in a newspaper while at the races with his friends on Boxing Day in 1990. Three months later he received a phone call from a man called Oliver Irwin, and within another three months he had moved to Zambia to manage a struggling meat factory – just as the country’s long standing ruler Kenneth Kaunda was ousted in the first multiparty elections. The business consisted of a small abattoir, feedlot, two butcheries and 50-odd staff, and not long after Grogan arrived in the country, Irwin retired to Ireland. His son, Carl Irwin, had just qualified as a chartered accountant and returned to Zambia (the country he was born and raised) to take over his father’s business. Together Irwin and Grogan managed to turn the business around. It was in 1995 that Zambeef hit its first big break. South Africa’s Shoprite, which is today one of Africa’s leading supermarkets, was at the beginning of its African expansion and entered the Zambian market with the purchase of a handful of stores that had just been privatised by the Zambian government. Zambeef was asked to operate Shoprite’s in-store butcheries in the country. With Shoprite as a partner, Zambeef began to grow rapidly, expanding its independent retail outlets too. Zambeef owns its entire supply chain, from farm to shop. According to Grogan, this stemmed purely from trying to meet the unrelenting consumer demand. While Zambeef grew through its meat operations, today it is the cropping and edible oil divisions that account for the largest chunk of the business. Its animal feed division (Novatek) owns the largest feed mill in Zambia. It was originally formed to supply Zambeef’s own demand, but currently sells to other farmers in Zambia and has a strong export market. Last year the company also announced a joint venture to establish Zamhatch with Rainbow, a South African processor and marketer of chicken. The partnership involves the development of a hatchery, breeder farm and feed plant. Zambeef listed on the Lusaka Stock Exchange in 2003, and in 2011 also started trading on the London Stock Exchange’s AIM market. While Zambia’s rising middle class is a big market for Zambeef, Grogan noted that lower-income groups have been equally important. The company is now also eyeing expansion outside of Zambia’s major cities. Zambeef recently built a wholesale outlet in the DRC-Zambian border town of Kasumbalesa, with another one under construction in Mongu in the west of the country. It also has expansion plans in numerous other secondary cities and towns. Zambeef has also set up operations in Nigeria and Ghana on the back of its partnership with Shoprite. The grocery retailer has ambitious plans for Nigeria over the next few years, with talk of around 25 new stores, and Zambeef will continue to operate its in-house butcheries. In addition, it is also growing its independent outlets. According to Grogan, the expansion into Nigeria required significant time and energy. The company had to send some of its top management to oversee its operations in the continent’s largest economy. While Zambeef’s West African operations are still relatively small, Grogan has a long-term vision for the market, and expects operations to start growing rapidly.